Once it's warm enough every spring, we pull the sand toys out of storage and greet the sandbox after the long separation all winter. 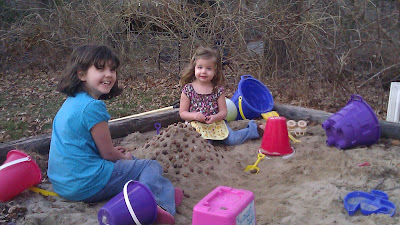 In this picture, the girls had collected hickory nuts in Avril's gardening apron from all over the yard and decorated their "castle" with them. Compare the picture above with the one below. I took this on the first spring day outside after we moved into this house, back when Norah was younger than Avril is now. Time flies.